In today’s world of instant communication it’s not nearly as common to write a letter or email to someone just to share your life with them, but I find that it is especially appreciated. Years ago I would write long letters to Phil’s mom telling her what was happening in our lives – the big things and the small things. We would talk with her on the phone at least once a week, but the letters provided more of the everyday things and the deeper what’s-on-our-minds things than we might communicate in a phone conversation. Phil now writes long emails to his sister sometimes. I always ask him to send me a copy of the emails because I get a different perspective of how he views what is happening in our lives as I read him describing situations and encounters to his sister. Reading a letter has a way of bringing us into the life of the person writing. Think about a time when you have received an unexpected letter or an email from someone you love. As you read, you enter their world for a short time. You can hear them speaking the words that have been written. You can see the gestures they might be making if they were standing in front of you telling you stories you are reading. The letters bring you into their presence. The same is true of God’s Word, but to an even greater degree because God’s Words are “God-breathed”. They were written under the anointing of the Holy Spirit and they carry that anointing with them. How amazing is that? I mean they are just words on a page, right? No, they are not. They are God-inspired and they bring us into the presence of a holy and amazing God. Pray before you read. This seems so obvious, but I find that it is so easy to forget this step. I sit down to read each morning and I might be so eager to read what’s next I just start reading. Or I might just be in the routine of things and forget to pray. Ugh! That’s so wrong. Remember, if Scripture is God-inspired (and it is), it is the Holy Spirit that unlocks that inspiration as we read. Pause to thank God for preserving His Word and speaking to you today through that Word. 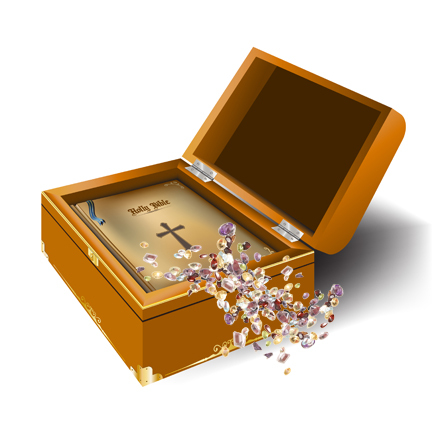 Ask the Holy Spirit to open its treasures for you. Even when we are reading for information we’ll find treasures that will stick with us throughout the day, and sometimes we’ll find treasures that change our lives forever. Avoid distractions. Find a place where you won’t be distracted by your To Do list. I find it helpful to have a piece of paper or spreadsheet open where I can jot down things that might flit through my mind that I don’t want to forget. Writing them down lets me avoid the distraction of trying to remember them. It releases me to return to reading. Look for application in your life. Regardless of how you’re reading, you always want to ask God how and what to apply to your life. Take notes or journal. Develop the habit of taking notes or journaling what you’re reading. I don’t do this every day, but frequently when a verse or an incident in Scripture grabs my attention, I will journal about it. The experience of writing about it opens my thoughts (or perhaps my spirit) to it so that I receive more insight into the passage or verse. I’m a writer, so my journal is all words with the occasional song or diagram. If you are an artist, perhaps your journal will be a collection of pictures instead of words. Let me note here that often when I start to write, I don’t have a clue what I’m going to write – I just know that a verse has caught my attention. So I start writing about it. It almost feels silly sometimes to be writing when I don’t know where I’m headed. But God (don’t you just love those two words? I do)…But God opens the door to more treasures as I write and Scripture becomes more alive to me. Now let’s look at the three different ways to read Scripture. It’s important to note that there is a great deal of overlap in the methods, but they are distinctly different. God will speak to you when reading using each method. Typically, when we are reading through the Bible according to a schedule or reading through the Bible in a year, we are reading for information – that is, to get the “Big Picture” and to understand the principles, facts and directives of Scripture. Reading for information is like reading a history book. You are reading to learn names, places, dates, facts. You are reading to learn the story of the Bible. But the Bible is more than a textbook and as you learn the story, you will see how it is the story that leads to salvation and power through Jesus Christ. What I love about reading through the Bible in a year is that by reading larger portions in each sitting, I see the inter-connectedness of Scripture. Reading for information is looking into the Word and brings light into your life. Reading for information engages your mind; reading for inspiration engages your heart. It is devotional reading and usually involves reading only a single chapter or story. Reading inspirationally allows you to get to know God more intimately and love God more deeply. It is reading at a slower pace. It is pausing to consider what characters are saying and thinking about what they’re feeling. It is reflecting on actions and words. Reading for inspiration is looking into the face of God and calms your spirit. Reading for transformation is the step beyond reading for inspiration. It is learning what God wants for and from my life. Primary purpose of the Bible is to change and transform us. The objective of reading for transformation is not to cover as much as possible or complete a specific reading assignment. You might find yourself on a single verse for quite a while (that is, a number of days or weeks). The point of transformational reading is meeting God in the text. It’s more indepth. You have to take time with it to hear what it says. The practice known as lectio devina (literally “divine reading” in Latin) is transformational reading. It involves reading the text slowly and with reflection, meditating on the text, praying through the text and waiting and listening for God to speak to us through the text. It is a relaxed, meditative process. If reading for inspiration is looking into the face of God, reading for transformation is crawling into His lap and listening to His heartbeat. What we typically call “Bible Study” occurs in all three methods, although you may find it more heavily in reading for information than the other approaches. But in all cases, good Bible Study guides, devotionals and commentaries can improve your understanding and personal application of the Bible in your own life. For me personally, I find that learning what the Greek or Hebrew words really mean greatly enhances my reading in all three areas. But I’m a word nerd. He may speak to you differently. The point is to not eschew outside help. God wants to speak to you, He wants to teach, inspire and transform you. He wants to see you become more like Jesus day by day. 13You will seek Me and find Me when you search for Me with all your heart. What is the Holy Spirit speaking to you today? This entry was posted on Tuesday, January 30th, 2018 at 12:11 pm and is filed under Scripture/The Bible. You can follow any responses to this entry through the RSS 2.0 feed. Both comments and pings are currently closed.